Here are a few small projects I put together last month. 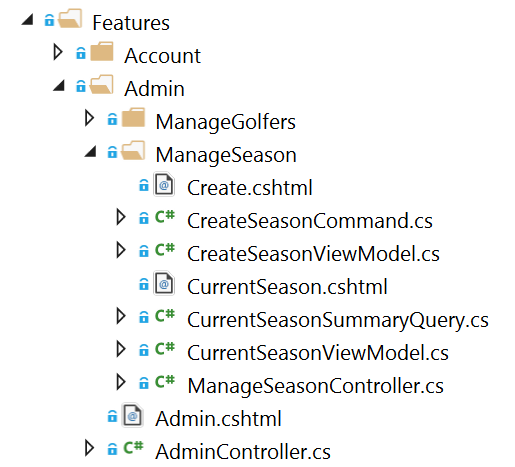 I think feature folders are the best way to organize controllers and views in ASP.NET MVC. 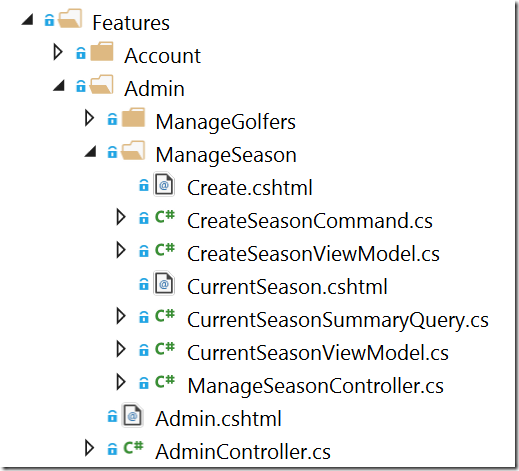 If you aren’t familiar with feature folders, see Steve Smith’s MSDN article: Feature Slices for ASP.NET Core MVC. To use feature folders with the OdeToCode.AddFeatureFolders NuGet package, all you need is to install the package and add one line of code to ConfigureServices. The sample application in GitHub demonstrates how you can still use Layout views and view components with feature folders. I’ve also allowed for nested folders, which I’ve found useful in complex, hierarchical applications. Nesting allows the feature structure to follow the user experience when the UI offers several layers of drill-down. With the OdeToCode.UseNodeModules package you can serve files directly from the node_modules folder of a web project. Install the middleware in the Configure method of Startup. I’ve mentioned using node_modules on this blog before, and the topic generated a number of questions. Let me explain when and why I find UseNodeModules useful. First, understand that npm has traditionally been a tool to install code you want to execute in NodeJS. But, over the last couple of years, more and more front-end dependencies have moved to npm, and npm is doing a better job supporting dependencies for both NodeJS and the browser. Today, for example, you can install React, Bootstrap, Aurelia, jQuery, Angular 2, and many other front-end packages of both the JS and CSS flavor. Secondly, many people want to know why I don’t use Bower. Bower played a role in accelerating front-end development and is a great tool. But, when I can fetch all the resources I need directly using npm, I don’t see the need to install yet another package manager. Thirdly, many tools understand and integrate with the node_modules folder structure and can resolve dependencies using package.json files and Node’s CommonJS module standard. These are tools like TypeScript and front-end tools like WebPack. In fact, TypeScript has adopted the “no tools required but npm” approach. I no longer need to use tsd or typings when I have npm and @types. This is very good decision! Thanks alot for your sharing! I tried the sample of AddFeatureFolders on GitHub but it doesn't work with nested folders. Yes, you have to have routes defined. Either UseMvcWithDefault route, or use the [Route] attribute, or a combination. The sample app didn't add a default route.